Went to look at a used 2012 TI. Seemed in reasonable shape for the age. Apparently had not been used for 2 years. It was covered but there was 2 inches of water in the hull. Had 2 obvious problems. A big scrape in the forward hold that takes the mirage drive (pictures linked). Seller didn't seem surprised it was there nor did he point it out as an issue to be aware of. It also comes with a 402 Torqeedo drive that has been sitting with full charge presumably for 2 years. The motor responds to the remote. It didn't initially but after a short charging time (10 min?) and some fiddling with the wiring it showed 99% charge and control worked. I have not been able to see the holes where the dolly mounts nor have I been able to do a float/leak test. Any advice is appreciated. Asking price is $3800 USD. Very difficult to assess the damage from that angle. Can you take one from above please? 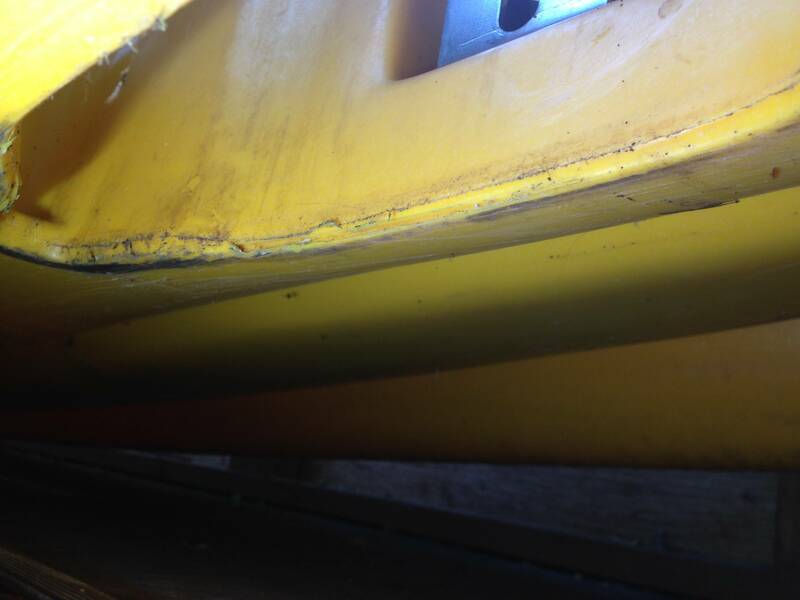 A crack in the area of where the Miragedrive rests on the hull at the front of the drive well is basically unepairable, and is usually solved by buying another hull at a discount from Hobie under their more than fair terms. However, the cost could seriously influence whether this Island is worth buying. Thanks for the reply. I have been away from the internet for the past several days. I can't get a picture at the moment because the boat is 1.5 hours away. I can say that I couldn't see even this damage or any other looking down from the top. Is there a photo around of this kind of Mirage damage you speak of? The owner has bought a repair kit and is planning on some surgery on this gauge. I wonder how fair the hull replacement terms are up here in Canada. I've always heard good things from the company so I would be hopeful. In general how is the 2012 hobie compared to the newer years? Any experience with the older Torqueedo drive? I am concerned about lithium cells sitting fully charged for that period of time.